If the idea of making bread seems intimidating, making bagels at home feels kind of overwhelming, but the truth is, they’re really quite simple and easy to make. Especially if you use a stand-mixer. I first shared this recipe with One Green Planet, but besides that recipe having a few major typos, I make these all of the time so I wanted to share them here on my blog as well. You could tweak this recipe in any number of ways – add a little bit of cinnamon and top with cinnamon/natural sugar before popping them into the oven; mix in dried onion flakes (and sprinkle some on the top before baking), or try adding some nutritional yeast to the dough for a cheesy flavor. 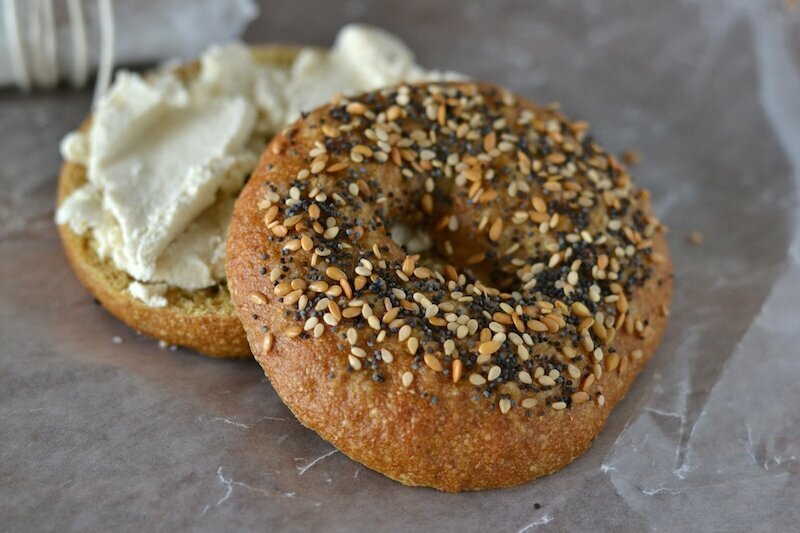 Anyway you go, nothing goes with bagels better than (cashew coconut) cream cheese, especially when that’s homemade, too. Don’t be intimidated by the thought of making bagels at home! This is an easy recipe that guarantees a soft, chewy bagel without any scary fillers or preservatives. Delicious with vegan cream cheez! In the bowl of a stand mixer, combine the water, yeast, and barley malt syrup. Let sit for a few minutes until bubbly. Add the bread flour, 1 cup of the whole wheat flour, the vital wheat gluten, barley malt powder, and salt. Using the dough hook, turn the mixer on to low and mix until a wet dough forms. Add more flour as needed to form a stiff dough. Continue to mix for 10 minutes, scraping down the sides of the bowl as needed. Lightly oil a large bowl and place the dough into it, rolling it around so that the dough is completely coated. Cover the bowl with plastic wrap and let the dough rise for about an hour. Line two baking sheets with parchment paper and lightly sprinkle with the fine cornmeal. Set aside. On a lightly floured surface, gently knead the dough for a minute and then cut the dough into eight equal pieces. Form each piece into a ball (as if making rolls), and then using your thumb, punch a hole into the centers, stretch and knead until you have a “life-preserver” shape. The bagels will puff a bit as they rise, so make the hole fairly big, otherwise it will disappear. Place the bagels onto the prepared baking sheets (four per pan) and lightly spritz with cooking spray. Cover loosely with plastic wrap and place the pans in the refrigerator overnight. When ready to make the bagels, remove the pans from the refrigerator and let rest at room temperature for 30-60 minutes. Meanwhile, fill a large pot with water, leaving about 2″ inches at the top. Preheat the oven to 425-degrees F.
When the water has come to a boil, carefully sprinkle in the baking soda. The water will bubble up. Place 2-3 bagels into the water and let them cook for 30 seconds. Flip the bagels and cook for another 30 seconds. Using a slotted spoon, carefully remove the bagels and place them back onto the baking sheet. Sprinkle with some of the topping. Repeat the process until all of the bagels have gone through the water bath. Place the pans in the oven and bake for about 15 minutes or until dark brown. Switch pans halfway through for even baking. Let bagels cool before slicing. I’m one of those people who finds the prospect of making bagels overwhelming, but thank you for the recipe and I hope I’ll try it some time. They look so professional and delicious in your photos. I eat a bagel for breakfast every day so it would be great if I were making my own. When you say ‘regular’ yeast, do you mean the dried variety? We get it over here in 7g packs, which I guess might be the same as a bit more than 2 teaspoons. If you can make scones (and I know you can and do!) you can make these, Lorna! Yes, regular yeast rather than “instant.” You’ll need about 2 1/4 – 2 1/2 tsp. Ooh Waw, Anne. These bagels look so heavenly & Oh so delectable too. I am going to make them this afternoon,…Ooh Yeahhh!! Those are gorgeous! I’ve always wanted to make bagels! I don’t know why I’ve never done it before! Do it! I’ll bet you could just use your pretzel roll recipe and shape bagels instead! OHH BAGELS!!! I have yet to attempt creating bagels!! These look wonderful. So many fun variations! I’ve never tried making bagels. Maybe I need to remedy that. bagels!! i havent made any in so long. these look fantastic. i have to get a hand onthe barley malt syrup. i think thats whats been missing in mine! Oh, I’ve been lax in submitting HVF entries! Thanks for the reminder!